Collecting Guineas is over. All that is left is that Cossack will be in the Arsenal until patch 8.0 drops on Jan 23rd. Guineas will also be converted to credits, 1 Guinea to 100,000 credits on patch 8.0 on Jan 23rd. You could only get 48 Guineas in-game, so always needed to buy at least two Guineas. Everyone got a one-time 10 Guineas for $1 special in the shop under specials. The other Guineas are there as well for $1 each. So if you have not yet purchased Cossack, check how many you need, pick them up and buy Cossack. For every Directive you complete you will get 1 Guinea. Guineas are used for the purchase of T8 Cossack and will last through patch 7.12 (Dec 19th 12th.) If you complete every Directive from the first Directive on Sep 20th to the last Directive on Dec 8th, you will get 48 Guineas. Cossack will be available for 50 Guineas in the Arsenal, through patch 7.12. You will need to buy a minimum of 2 Guineas to purchase Cossack. Based on the pricing of other T8 DDs, 2 Guineas should cost roughly $1-2. There very well can be a package of 50 Guineas in the shop for $40ish or whatever the T8 Cossack Pricing is set to be. NOTE: Guineas will most likely be converted to credits on Jan 23rd 9th 22nd Dec 12th Jan 9th. BUY Cossack as soon as you have 50 Guineas! EDIT: Guineas and Cossack showed up in the shop on Fri, Sep 21st. No idea how long Cossack bundles will be in the shop. The rest of the RN event is over. The rest of the event is over. LAST WEEK of the RN event. Event ends Dec 12th early in the morning. Guineas last until update 8.0 in January! Ok. Here is a run down on how the RN event works. You can jump down to the section you need to read about as I know this is long. First it starts Thu, Sep 20th and runs until early morning Dec 11th. It is broken down into patches (month), Stages (week), Directives (days) and Missions. Sovereigns are over and were converted to credits, 1:25k, on patch 7.11 Nov 21st. Dates on the end of Sovereigns and Guineas changed again. Since the patch date for 7.11 was pushed back a week, the end date for Sovereigns was pushed back a week. SPEND YOUR Guineas before Jan 22nd. Guineas were supposed to be inclusive of patch 7.12, which drops on Dec 12th(? or19th? ), so Jan 22nd makes more sense. Although if patch 7.12 drops Dec 12th, then 8.0 should be 4(5?) weeks later at Jan 9th(? or 16? or 23rd?). Just plan on buying Cossack before the end of the year for sure or even better, as soon as you hit 50 Guineas. Patch 7.12 could end as early as Jan 9th, so the Jan 22nd date is looking suspect. If patch 7.11 is 4 weeks, then 7.12 drops Dec 19th. 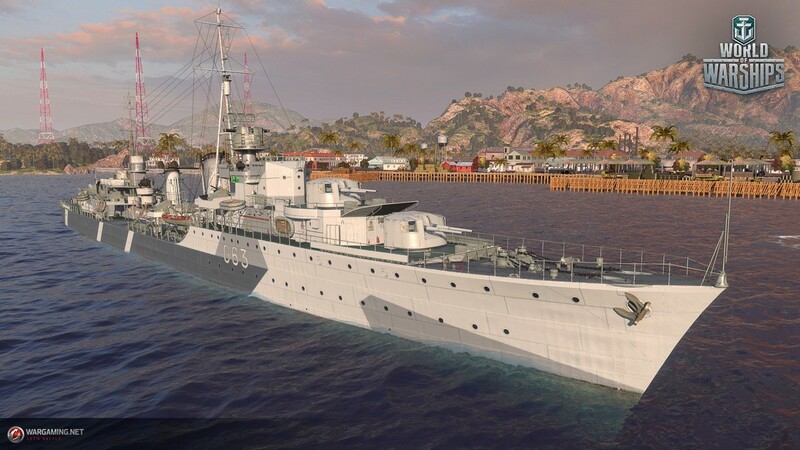 Patch 7.12 looks to be 5 weeks long with the Dev blog saying that the "In the Name of His Highness" (T6 BB Prinz Eitel Friedrich reward) is 5 weeks long, so that means patch 8.0 could drop Jan 23rd and the in-game note is right. With the ambiguity, I HIGHLY suggest buy Cossack as soon as you hit 50 Guineas. No we don't know how many credits each Sovereign will be worth yet. Edit - 25,000 credits per Sovereign and will be converted with Patch 7.11 on Nov 21st 14th. No, we don't know how many Sovereigns we can earn yet. Edit - 15 Sovereigns per Directive, so 60 Sovereigns per week. One or two patches(?) 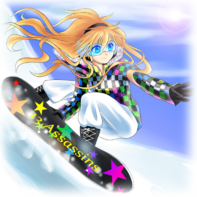 so 480(? 240?) Sovereigns in total without a UK DD. Confusion Reigns. You can earn a max of 48 Guineas. We do not know how much they will cost yet, but should be roughly $1 each. Edit - 1 Guines is $0.99. Special one-time offer 10 Guineas for $0.99. Hall of Fame restarts each week. You start getting HoF points after you complete the 4th Directive that week. You do not need to have a UK DD to complete Directives. Everyone will get access to UK DDs on Oct 17th when patch 7.10 drops the full UK DD line. One task in Directive III and one task in Directive IV in patch 7.9 must be done with T7 Jervis, T8 Lightning, and/or T8 Cossack. You can still complete the Directives without using a UK DD. Nothing yet on when Hall of Fame rewards will be handed out when a Stage ends. EDIT: supposed to be right after Stage ends, but there was a problem. WG is aware and it working on it. EDIT WG fixed it for the first Stage and it is working now. You can not go back and complete Missions and Directives in Stages that have ended. Almost all of the Missions in patch 7.10 (Halloween Event) can be done in Scenarios that are T5+. Royal Navy DD collection coming in patch 7.11 on Nov 21st. Works in Daily containers as well and it is a permanent collection. Sovereigns have been converted to credits. Except for Cossack, the UK Arsenal is gone. Every Patch and Stage you will get one of these i the upper left of the port. It will track the Missions and Directives. We will break down the pieces shortly. Let's start with the most basic part of the Royal Navy (RN) Event and that is the Mission. It is the middle section above and lets focus on it here. Missions can be completed in Random (PvP), co-op (PvE), Ranked and/or Arms Race. 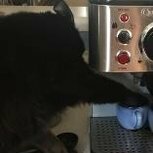 Operations will not work. (NOTE: Some operations will work, but will be noted separately) Stage 3 patch 7.9, there is a collect 10 stars missions that works in any operation. Note: Patch 7.11 Missions start Nov 22nd, so we will find out the quirks then. (Nov 21st update). Stage 1's special mission was for Warspite. Stage 2's special mission is for Cossack and/or Haida. 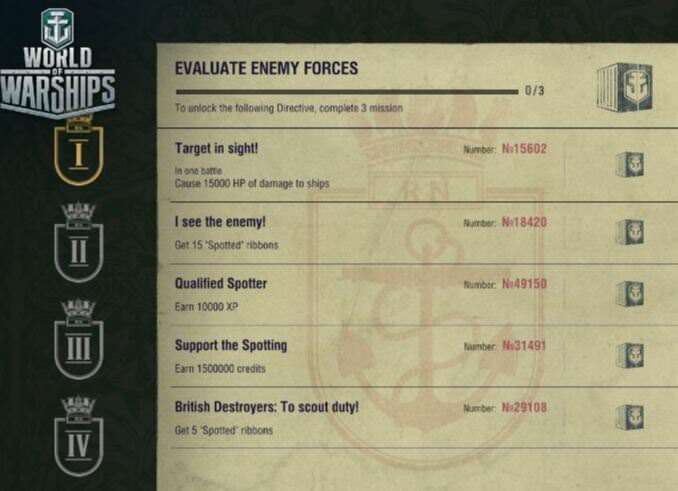 As you can see there are 5 Missions and one requires a British DD. For patch 7.9, that will be Gallant or an early access UK DD (more on them later). The Missions are all active at once, so you can complete multiple ones in one battle. There will be a tracking bar on the ones you complete over multiple battles to show your progress. The boxes to the right are the rewards for that Mission and some of them will be RN crates with Sovereigns and other stuff. More on RN crates later. You can only complete a Mission once and need to complete Missions by the Tuesday Wednesday, most likely before 7am EST (4am PST), after the Stage is released. 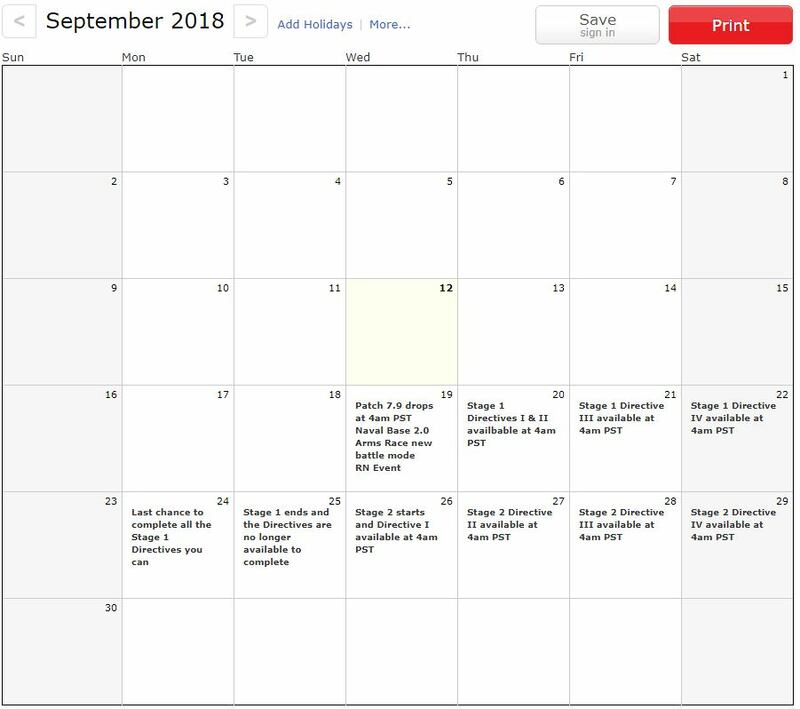 WG said in the RN Rules that a Stage ended Tuesday, but it is Tuesday, Sep 25th and people are still completing Missions, so instead it looks like Wednesday morning instead, see pic below. Edit: you do not have to complete the UK DD missions if you do not have a T5+ UK DD in patch. The UK DDs come out on Oct 17th on patch 7.10 so everyone will have a chance at a T5+ DD for the last 2/3 of the event. Edit: Looking at stage 1 in the game, the first four Directives have 5-7 Missions. You do not need to have a UK DD to complete Directives in this patch, but it makes it easier. UK DD full line comes out on Oct 17th. 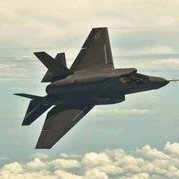 - One Mission in a 5 Mission Directive is a UK DD mission leaving 4 Missions that are any ship T5+ and you only have to compete 3 Missions to complete the Directive. There are two RN containers in the regular Missions as rewards. - One Mission in a 6 Mission Directive is a UK DD mission leaving 5 Missions that are any ship T5+ and you only have to compete 4 Missions to complete the Directive. There are two RN containers in the regular Missions as rewards. - Two Missions in a 7 Mission Directive are UK DD missions leaving 5 Missions that are any ship T5+ and you have to compete 5 Missions to complete the Directive. 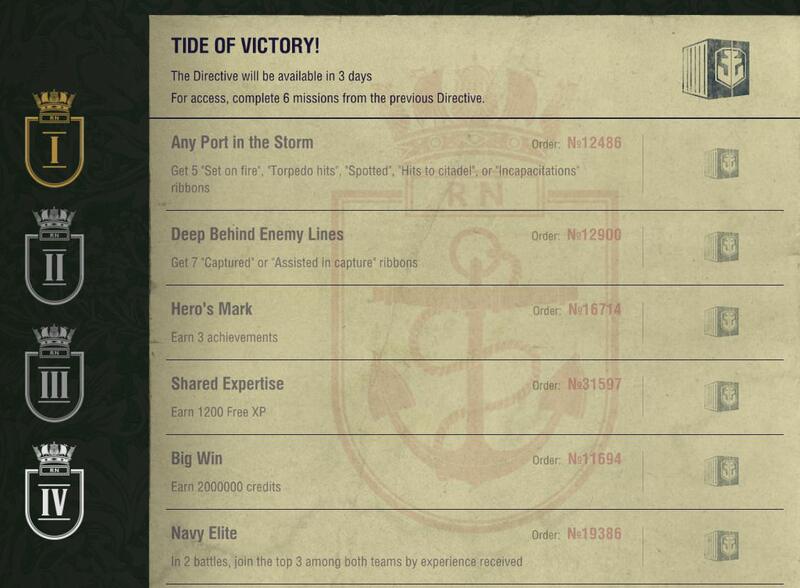 There are two RN containers in the regular Missions as rewards and one (or two) RN container(s) for one UK DD Mission (T7+ UK DD only). 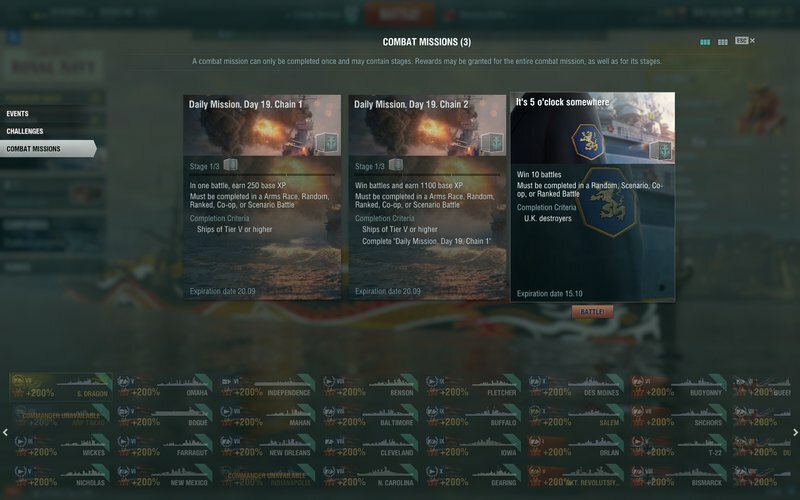 EDIT: The UK DD missions that reward a container are for T7+ UK DDs only. There will be 5 Stages in patch 7.10 and 3 Stages in patch 7.11, The fifth Stage will have the same format. There will be 3 Stages in patch 7.11. 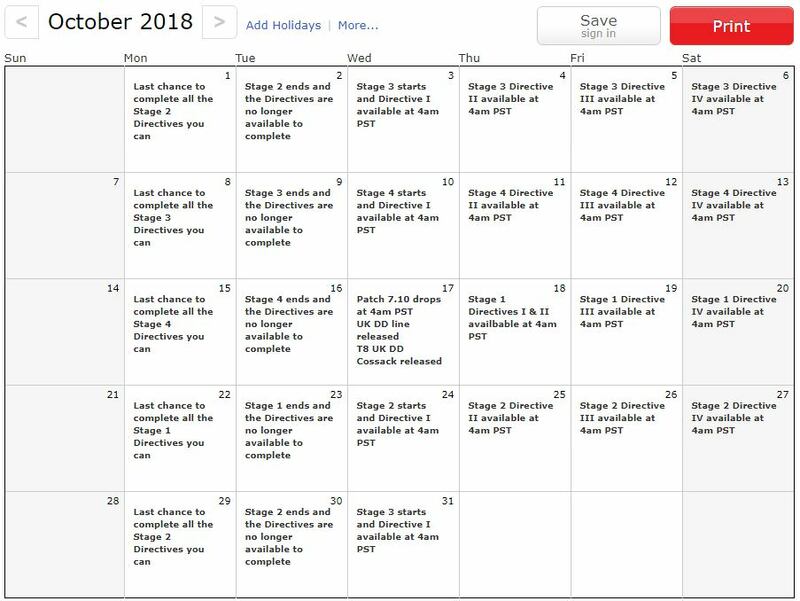 This pic from the RN rules show the Stages as ending on Tuesday, but evidently they don't end until 7am EST on Wednesday as it is Tue, Sep 25th and people are still completing missions. NOTE! Directive IV for Stage 3 (patch 7.9) that drops Sat, Oct 6th, has one Mission that requires 10 Stars from Scenarios. It doesn't specify the current Raptor Rescue this week, so you should be able to get Stars from any Scenario. Also you do not need to complete this Scenario Mission or the T7+ UK DD Mission to complete the Directive to get your Guinea. You only need 5 Missions to complete the Directive and there are 5 Missoins for T5+ ships that you can complete. Next up the ladder are Directives. You complete a certain number of Missions to complete a Directive. Here is the screen with the part on Directives. 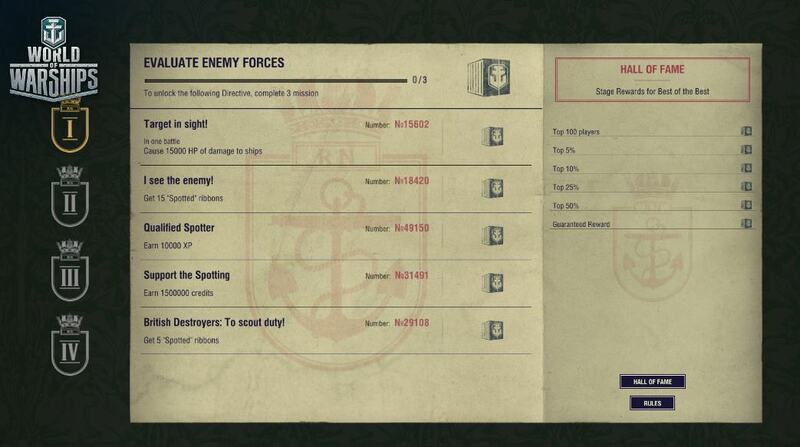 At the top is the number of Missions, middle section, that you need to complete to complete the current Directive. In this case, it is 3 of the 5 missions to complete the Directive and the big box on the right in the Directive reward. It will always be 1 Guinea and possibly something else as well. Edit: you do not need to complete the UK DD missions to complete a Directive. 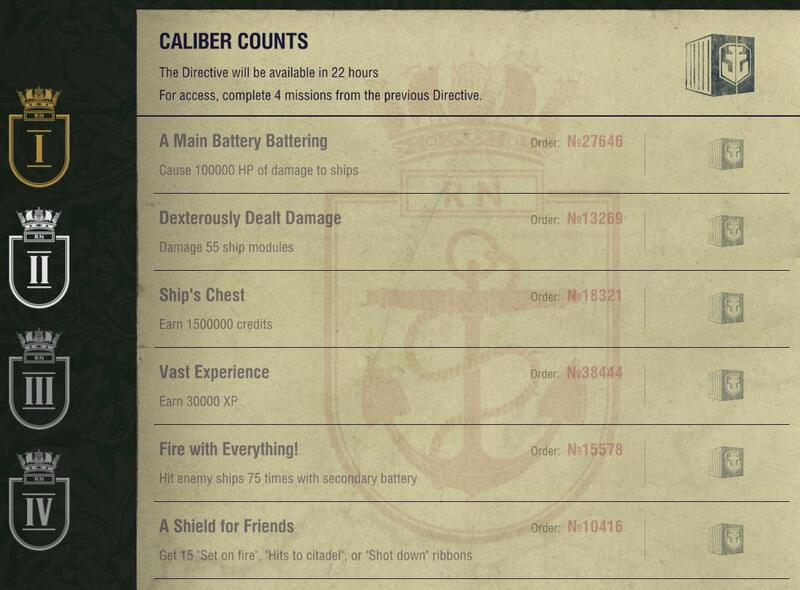 Edit: For the first Stage, each Directive gives 1 Guinea and 1 RN container. Note: For patch 7.10, almost all the mission can be done in Scenarios for the Halloween event (except Saving Transylvania as it is T3 and you need T5+ to complete the mission) along with PvP, PvE, Ranked and Clan battles. Instead of UK DDs there is one for Cossack/Le Terrible that gives 10k ECXP and one for earning Stars that can only be done in the Scenarios. 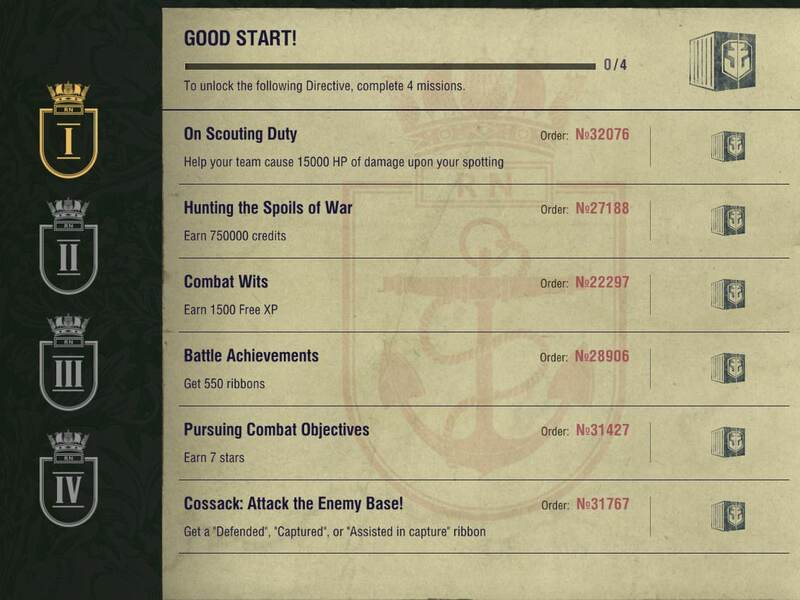 You can complete the Directives without getting Stars or using Cossack/Le Terrible, by completing all of the other Missions. Note: For patch 7.11, almost all of the missions can be done in Random, Co-op, Scenario and Twilight Battles. The shields on the left are the Directives for that Stage. Directive I will come out on Wednesday mornings at 7am EST (4am PST). Directive II will come out on Thursday mornings. When a patch drops, Directive I & II will come out on Thursday morning. Directive III will always come out on Friday Morning and Directive IV will come out on Saturday Morning. You will have until Tuesday Wednesday, most likely until 7am EST (4am PST), to complete the Directives for that Stage. You can not go back and complete old Stages. If you can only play sometimes and can schedule when you can play, try to play Sat to Mon if you can to maximize having all four Directives available at once. 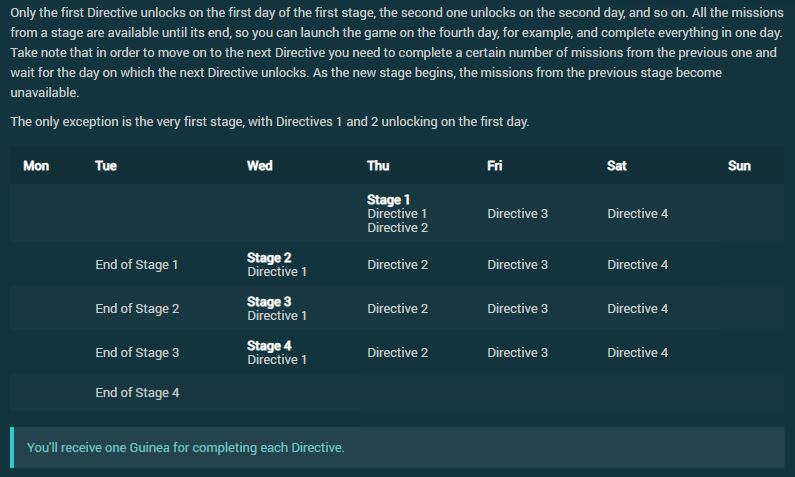 You click on the shields to change from Directive to Directive in a Stage and Directives can have from 5 to 7 Missions and you have to complete 3-5 Missions to complete a Directive. NOTE: Guineas will most likely be converted to Credits on Jan 22nd 9th. May be Jan 9th again or the 23rd if patch 7.12 is 5 weeks long and 7.11 is 4 weeks. Buy Cossack as soon as you hit 50 Guineas. EDIT: Here are all the Directives from Stage 1-4, patch 7.9. NOTE: One UK DD mission in Directive III and Directive IV requires a T7+ UK DD so you will need an early access UK T7+ DD in patch 7.9 to complete it. ALL other UK DD missions are T5+ UK DD. Pics of all of the Stages from patch 7.9, 7.10, and the other completed stages have been moved to page 11 of the thread. Current Stage is Stage 1, patch 7.11 that starts Nov 22nd. You can complete all the Directives in Stage 5, patch 7.10 without doing a Halloween OP or having Cossack and/or Le Terrible. Most Missions can be completed with a T5 ship in Random, Twilight, Co-op, Ranked, or Scenario Battle. The special Warspite Missions can only be completed in Random, Co-op or Scenario battles. 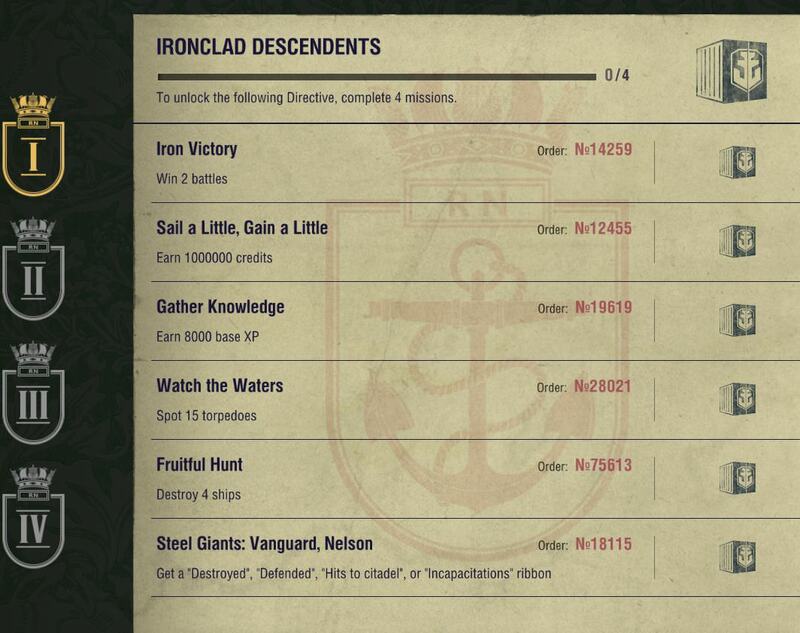 Stage 3, Directives You can complete all the Directives WITHOUT using Vanguard or Nelson if you do not have it. Directive I, complete 4 of 6 Missions. Vanguard/Nelson Mission gives a RN DD Container. Directive reward is 1 Guinea, 1 RN DD container & 500 coal. Starts Wed, Dec 5th. Directive III, complete 6 of 8 Missions. Vanguard/Nelson & receive 7.5M potential damage Missions give a RN DD Container. Cause 150,000 HP mission gives 5,000 XP to the ship that completes it. Directive reward is 1 Guinea, 1 RN DD container & 1,500 coal. Starts Fri, Dec 7th. Directive IV, complete 6 of the 8 Missions. Vanguard/Nelson & earn 3 Achievements Missions give an RN DD Container. Directive reward is 1 Guinea, 1 RN DD container & 2,000 coal. Starts Sat, Dec 8th. Stage 3 ends at 7am EST (4am PST) on Wed, Dec 12th and is the last Stage ending the RN event. Guineas stay until patch 8.0 in January. The RN event runs over 3 patches, 7.9, 7.10 & 7.11. This will be from Sep 20th to Dec 11th. Halloween event with both old events and the new Sub one. Edit: There will be 5 versions of Halloween Scenarios. Easy and hard versions of the second & sub Scenarios and the three regular scenarios. Sovereigns are converted to credits on Nov 21st 13th! Twilight Battle Halloween PvP mode with Halloween ships, but evidently no Halloween Cmdrs. Patch 8.0 is looking like Jan 23rd. In Update 0.7.10, you can get 24 standard pumpkin-like "Halloween" containers for completing the Royal Navy missions and earn 3 containers for completing the Halloween operations. Besides this, you can obtain some Halloween containers in the new Daily Shipments section, Oct 31st to Nov 9th. Pumpkin rewards - Looks to be a pumpkin container for completing a Directive and for Directives III & IV to have a mission to get a pumpkin. The Devs said that there would be 24 pumpkins from the RN part of the event, which would be 6 pumpkins per Stage for the first four Stages. NOTE Premium containers are not in the shop right now. Will probably hit the shop on Fri, Oct 19th with the normal shop reset. Price unknown at this time. NOTE: RN container bundles in the premium shop are available for purchase until November 12th at 4:20 AM PT (7:20am EST) When containers were first added to the shop, a note said that they would be available until Nov 12th. Fri, Nov 2nd, the RN containers were removed without warning. EDIT: Evidently RN containers will not be earnable in patch 7.10. Evidently, you can only earn them in 7.9 until Oct 16th. @Bonfor noted that Halloween containers are out in 7.10 and the 7.10 dev bullentin says that they will be rewards for the RN event in 7.10. RN crates will be earned in the Missions that you use to complete the Directives. You can also get them in the Hall of Fame each Stage (more below). You can buy premium RN containers in the shop. We may be able to earn some premium containers in game. Here is what they will contain. Edit: premium RN containers are in the shop. Patch 7.11 will bring a new RN container in game and a premium RN container in the shop on Nov 21st as well as a new permanent collection. The RN containers will replace the Halloween containers as rewards in the Missions and Directives. 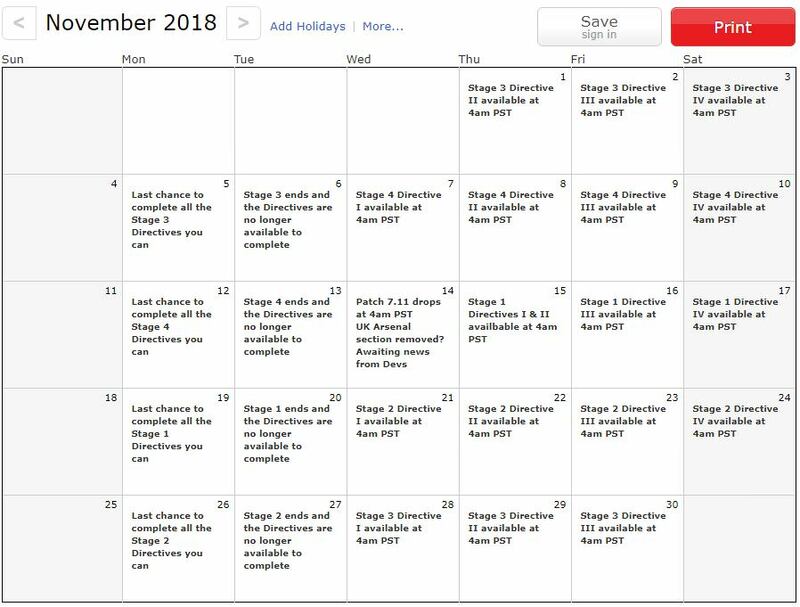 Not sure how many RN containers will be in each Directive at this time (Nov 13th). There will be 16 items in the collection broken up into 4 sub-groups. The sub-group rewards will be the ability to mount 2 flags on UK DDs, UK CLs, UK BBs and Commonwealth ships (Vampire, Perth & Haida). 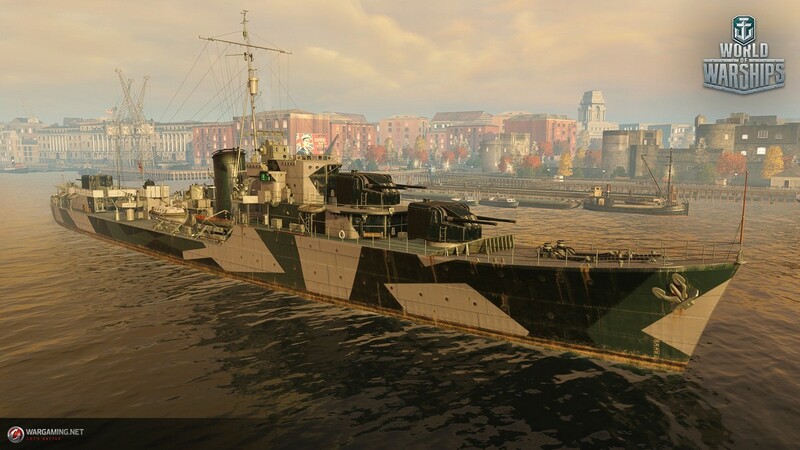 The main reward will be perma-camo for T7 Haida and T8 Lightning. You can set the RN DD collection to be dropped in the Daily Containers as well. You can earn up to 10 RN DD containers in Stage 1 of patch 7.11. In Stage 2, you can get up to 6 and up to 10 if you have Cossack/Haida. I expect Stage 3 to be similar. This looks like the normal Haida perma-camo to me, so don't know why you would need a second one. Appears to be the normal perma-camo in game. Patch 7.11 will only have 3 Stages of 4 Directives each as Patch 7.10 had 5 Stages. But since the collection also comes in the Daily Containers, you don't have to worry if you miss some RN containers in the event. The new British DD containers are out today, Wed Nov 21st in the shop. 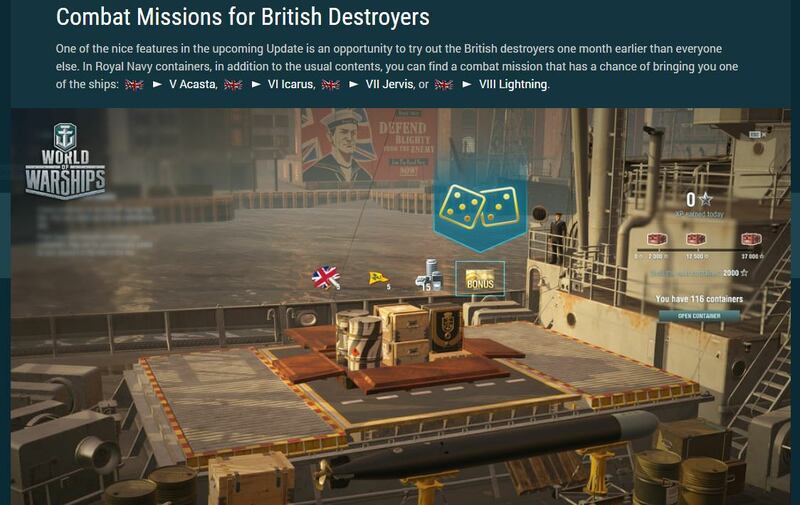 Just so you know, there will be in-game British containers in the RN event as rewards for completing Missions and Directives (most likely) tomorrow when Directives I & II start. The RN DD collection will also drop in daily containers. So if you just want to complete the RN collection for the Lightning perma-camo, then you DO NOT have to buy any containers. If you want Dragon flags or Union Jack one-use camos, then the premium shop RN containers offer up to 20 off one of those in each container. At $5 per box, that makes the flags or camos 25 cents each. 20 Union Jack camouflage patterns or 20 special signals of one of the following types: Dragon, Wyvern, Red Dragon, Ouroboros, Hydra, Basilisk, Scylla, or Leviathan. 1 Union Jack camouflage pattern or 1 special signal of one of the following types: Dragon, Wyvern, Red Dragon, Ouroboros, Hydra, Basilisk, Scylla, or Leviathan. Once again, you DO NOT have to buy ANY RN DD containers in the shop to complete the RN DD collection for a Lightning perma-camo. So you will be able to buy things in the Arsenal for Sovereigns. You earn 5 sovereigns in each in-game RN container and there are 15 Sovereigns in premium RN containers. You apparently can earn some premium RN containers in game (Directive IV has one Mission with a premium RN container that needs a T7+ UK DD) or buy the premium RN containers in shop. You can also buy in-game RN containers in the Arsenal for Sovereigns. 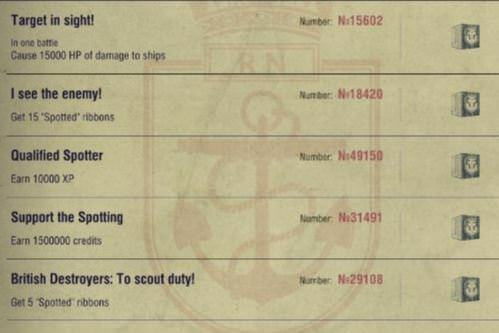 As a SWAG, I don't think we will be able to earn 420+ sovereigns in game (Warspite and Gallant) and nothing in the article says how many Sovereigns we can earn. 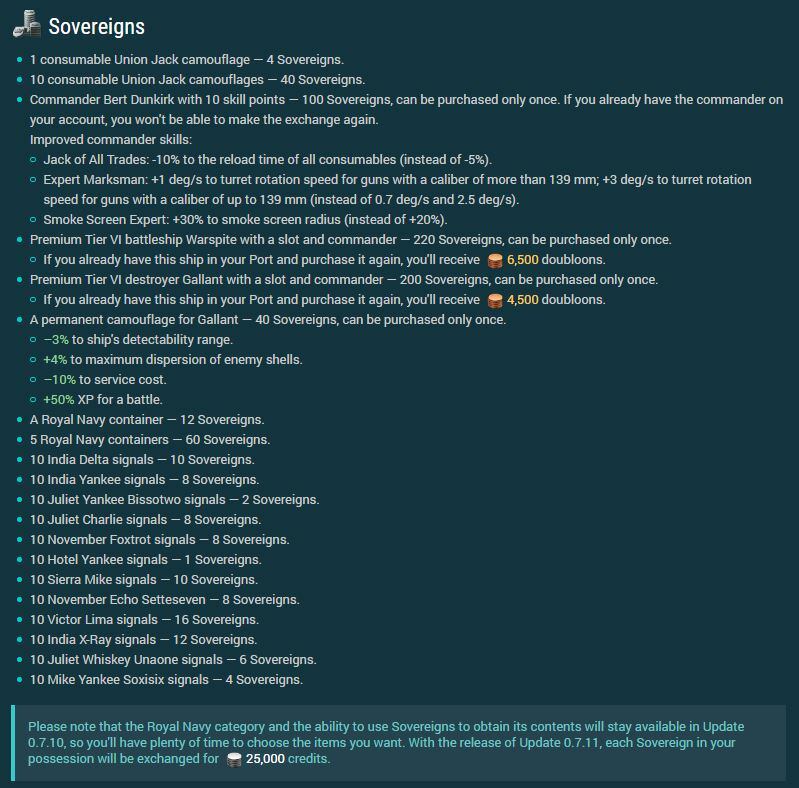 Here are all the things you can get for sovereigns in the RN Arsenal. Yes, you can get combat signals for Sovereigns. NOTE: Sovereigns are going to be converted to credits on Nov 21st 14th when patch 7.11 drops. Spend your Sovereigns before then. EDIT: With the release of Update 0.7.11 (Nov 21st 14th), each Sovereign in your possession will be exchanged for 25,000 credits. 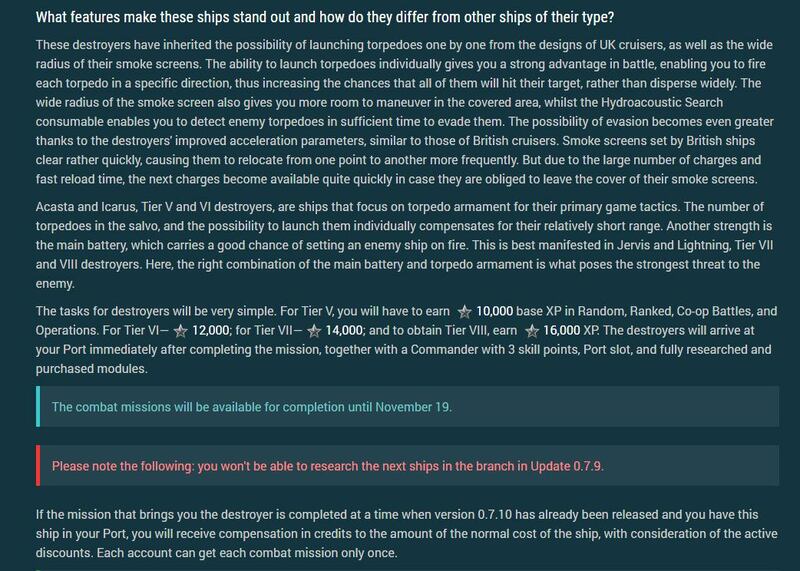 EDIT: @Jester_of_War did the math on the first set of Directives for Stage 1 and if the other Stages are the same, we should see 480 Sovereigns total if you complete every non-UK DD Mission with an RN container and all of the 7.9 & 7.10 Directives (32) as they reward an RN container. If you have a T5+ UK DD, you should be able to get another 80 Sovereigns with an early access T7 DD or grinding to T7 after patch 7.10 (16 total RN containers in UK T7+ DD missions in the two patches are expected). If you get into the top 25% of the HoF each week, that is another 40 Sovereigns (8 RN containers). The amount of RN containers we are projecting is based on this first Stage. Things may change over the next two months. And if you already have a Tier 5 T7 RN DD, you can do better than that. EDIT: The 7.10 Dev Bullentin is saying that Sovereigns are only earnable in patch 7.9, so only 240 Sovereigns earnable without a UK DD? Dropped patch 7.9 Sep 19th and except for Cossack leaves Nov 21st 14th. So spend your Sovereigns by Nov 20th 13th! In the in-game RN containers, there will be a chance to get an early access mission (when you open the container) for a T5-T8 UK DD during patch 7.9 starting Sep 19th. The premium RN containers have a increased chance of a early access mission. These are RARE drops, so it may take many, many containers to get an early access mission. The UK DD line will drop on patch 7.10 on Oct 17th. NOTE: The combat missions will be available for completion until November 19. EDIT: If you get an early access DD, it is yours to keep it when the UK DDs go live on patch 7.10 on Oct 17th. XP stays on it and you can research the next ship when the line goes live if you have the required XP. Captains can move in and out of the early access DDs until the line goes live, then captains will need retraining like normal. Also if you have a captain not trained on the ship when the patch goes live, he will need retraining on the ship. The Early Access missions will be as follows and if you complete it, you get the DD with the stock modules researched and purchased, a 3pt Cmdr and a port slot. You will be able to find the Early Access mission in your Personal Assignments if you get one. If you get an early access mission and complete it after patch 7.10 drops and you have that T5-T8 DD in port, you will get the base credit cost of the ship with all active discounts. EDIT: full patch notes and a screen shot of an early access mission dropping. The Hall of Fame is for bragging rights and getting extra stuff for placing in the top 50% of the NA players who earned HoF points from this event. Since, this is based on points earned from this event, you don't have to be a 50% WR player to place in the top 50% of the RN Event Hall of Fame each week. Every battle you play in a T5+ ship, after you complete Directive IV in a stage (during the RN Event) will earn points for sinking ships, victory and/or achievements. So the earliest you can enter the Hall of Fame competition for a stage, is Saturday, after you have completed Directive IV. Each Stage's Hall of Fame competition will run from from the earliest you complete Directive IV early Saturday morning to Tuesday Wednesday at 1am PST. The points break down will be below. All battle modes are competing in the same Hall of Fame each stage and you can play any of the battle modes you like to earn Hall of Fame points for that stage. Only T5+ ships count for HoF points. Hall of Fame rewards earned each stage. As of 10:30am EST Sep 26th, nothing on when HoF rewards will be handed out. Hall of Fame rewards have been buggy, but WG has been fixing it a week or so later. 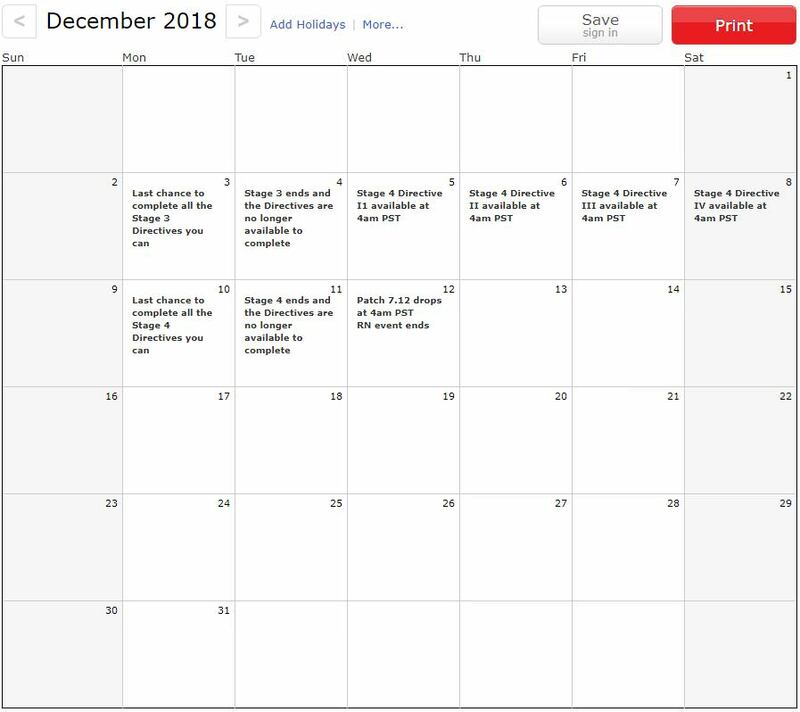 For those of you, like me, that like to see things on a Calendar. Here are the dates for each patch. Patch 7.9 drops Sep 19th and Stage 1 starts Sep 20th NOTE, UK DD missions during this patch can only be completed with T5+ premium UK DDs like Gallant, Cossack or an early access UK DD. NOTE: WG stated the Stages end Tuesdays, when it appears they actually end on Wednesdays at 7am EST (4am PST). Patch 7.11 drops Nov 21st 14th and Stage 1 starts Nov 22nd 15th. RN event ends on Dec 12th when patch 7.12 drops. The 48th Directive drops Dec 8th and the RN event ends at 6am EST (3am PST) on patch 7.12 Dec 12th. Wow great work! Thank you! 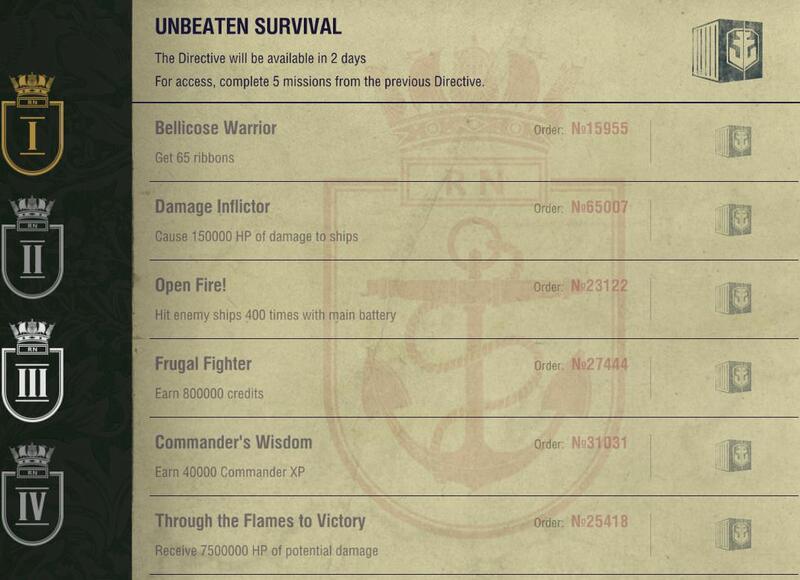 So when it's live, some missions will require an RN DD to complete? But you do not need to complete each mission to complete the directive so … yes please! If I only earn lets say 20 Guineas, I presume I will need to buy the remaining 30 from the shop, Is this correct? sorry, but WG never explained anything about this, and I am so confused. It won't stop you getting the major gains. Killjoy by name, killjoy by nature, I guess. Correct. You will be able to earn a max of 48 and would need to buy 2. But yeah pick your pain point. You and everyone else is welcome. It makes sense to me, so I thought I would answer any questions. Is this the mission (It's 5 o'clock somewhere) that requires Early Access DD or Gallant? I'm Sorry for asking but it seems like WG is starting to obfuscate exactly what we need to do or requirements needed to complete a mission. Like they said, yes some missions require a UK DD, but I noted you only needed to complete three of the five missions to complete the first Directive, so you don't need a UK DD. Chillax. It is easier than you think. I'm Sorry for asking but it seems like WG are starting to obfuscate exactly what we need to do or requirements needed to complete a mission. No i was able to use the cambleton tier 3. But it only gets you a symbol. Nope, separate mission. The early access missions are base XP. You can find out the amount you need in the first post. Paradat has it on the nose. When Guineas hit the premium shop, probably Friday, Sep 21st, we will know the prices of Guineas. My SWAG is that 2 Guineas will be $1-2. If WG wants $40 for Cossack for example, I can see a 50 Guinea bundle for $40. And say a 25 Guinea bundle for $21. These are all examples as I do not have the Guinea prices. The Cossack should be between $40-50 as a guess based on other T8 DDs. Lets hope they do a "Any amount of Guineas bundle" like they do with doubloons. That would make the most sense. I could also see it as 1 Guinea, 5 Guineas, 10 Guineas, 25 Guineas & 50 Guineas. We will have to wait and see. Hmm, am I missing something or is the following the case? (Regular) containers cost 12 sovereigns to purchase via the Arsenal, but regular containers also yield 5 sovereigns - so you can have the other contents for an effective cost of 7 sovereigns? Premium RN containers are in the shop now as well for everyone's FYI. I'm going to ignore this topic so I can complain endlessly in two months about how WG stole my tokens. I'm in it for the long game. I know right? Tons of posts about spend your tokens and still people complained. I only had 8 tokens, it was frustrating finding so many things I could buy (Sarcasm), so I bought just 1 camo.